girish: TIFF 2018: Astra Taylor's "What is Democracy?" TIFF 2017: Chloe Zhao's "The Rider"
Astra Taylor’s documentary What is Democracy?, which opens on January 16 at the IFC Center in New York City, promises to be among the year's most important films. When critics speak of “ambitious” movies, they usually have in mind narrative or formal reach. But Taylor’s ambitions here are neither; instead, they are political and activist. She has designed this film to spark conversation and discussion on a broad scale, to make an intervention in culture, to help contribute to the project of social change. Because the word “democracy” is embraced by an unnervingly wide range of people on the political spectrum—and thus frequently co-opted and abused—Taylor wants to put it under scrutiny, to interrogate and analyze it. She recently confessed in an interview: “words like ‘justice,’ ‘freedom,’ ‘equality,’ ‘socialism,’ and ‘revolution’ spoke to me … but not ‘democracy.’” It is her personal ambivalence about the word—and the uneasy mixture of ideas swirling behind it—that motivate this film. Living as we are in a “golden age” of documentary, my biggest fear with What is Democracy? is that it will be lumped into the large and baggy category of “issue docs”—and disappear into the VOD void. This would be a terrible mistake. Let me outline three reasons why. First, most issue docs plunge into a problem subject of the moment, and seek to interest and educate the public about it. The notion of democracy is of burning importance in our world today, but Taylor’s film wants to consciously take a step back and adopt a long view. Rather than being sucked into the rough-and-tumble of the present global moment, Taylor’s aim—while being completely in touch with the pulse of the now—is to move the film into a philosophical register. If that film was firmly based in the interview form, What is Democracy? is a little different, positioned somewhere between interview and dialogue. While according ample respect and time to the people she interviews, Taylor herself has a greater presence in this new film. She is an active interlocutor, and her exchanges with her interview subjects add to the dynamism of ideas staged here. Taylor’s Socratic approach does have antecedents in cinema—she is, for instance, greatly inspired by films such as Edgar Morin and Jean Rouch’s Chronicle of a Summer (1959)—but the broad historical and philosophical curiosity of her approach feels truly original and valuable. A second reason that sets What is Democracy? apart from most issue documentaries is how deeply ambivalent it is about its subject. From the start, rather than focusing on democracy alone, the film chooses instead to trace the twinned histories of democracy and capitalism. We begin in Athens, the birthplace of democracy, with a group of scholars who discuss not only its origins but also its pitfalls, including its risk of co-optation by wealthy demagogues. 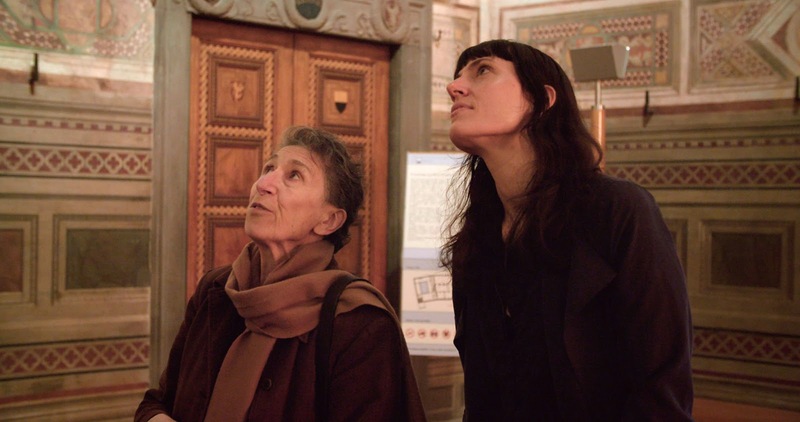 In another set of sequences threaded through the film, Taylor and feminist/Marxist philosopher Silvia Federici stand in front of a historic fresco in Siena, Italy—Ambrogio Lorenzetti’s “The Allegory of Good and Bad Government,” painted in the 1330s—and analyze the way it depicts the beginnings of financial capitalism. This idea of a global democracy … sounds good, but it's conceptually incoherent. The challenge of our time is figuring out how we set up boundaries, set up the lines to demarcate a community in a way that's not awful, that's not racist, that's not misogynist, that's not xenophobic or exploitative, because people should have a say over the decisions that affect their lives. Should I be telling a teacher in Italy how to run their school? No, I'm not part of that community. I should be excluded from it. I don't live there. I don't know what they're going through. I don't know the history. Taylor’s ambivalence about democracy and the claims made too easily in its name were also the impetus behind her 2014 book, The People’s Platform: Taking Back Power and Culture in the Digital Age. In the book, she argues that even though the Internet has been hailed as a democratizing force, such a techno-utopian vision obscures the ways in which the Internet (in her words) “reflects and amplifies real-world inequities at least as much as it ameliorates them. Online, just as off-line, attention and influence largely accrue to those who already have plenty of both.” In a way, the film extends this critique of democracy and its rhetoric from the Internet to the world at large. I wanted to make a film where, instead of ending with this big, rousing protest, and epic music, and this idea that we can hold hands and march into a new world, we addressed the spirit of the day after — the day after the big march, the moment after the euphoria, when the challenge is "what do you do?" That energy is dissipated, but the problem is still there. Astra Taylor, for me, represents a certain kind of boundary-crossing figure in culture who is invaluable but rare. In addition to being a filmmaker, she is a writer and a musician (and member of the acclaimed band Neutral Milk Hotel). She is also an activist who, as part of the Occupy movement, co-edited the broadsheet Occupy! An OWS-Inspired Gazette, whose issues later grew into a book about the movement. Despite the fact that Taylor spent years working on What is Democracy?, film for her is only one form of cultural work—part of a network of forms held together by an encompassing commitment, that of activism. She does not romanticize the role of art: “A film is not organizing,” she has said, “A film is not activism. A film is a film. Be humble about what its role is.” However, taken as a whole, Taylor’s practice gives us an anti-specialist model that shows us the interconnectedness of artistic, cultural and political activities—and this is a useful example that is all the worthier for being uncommon. pic: Taylor with Silvia Federici.